Mum Loves Cooking: Nuts! It's Steamed! I love eating steamed chickpeas because they are such a cheery snack. They're my guilt-free snack, full of yummy goodness. I pack some for Ethan to take to school for recess, and he shares it out with his friends. Edna loves eating chickpeas as well, and would growl (yes, literally growl) if we don't feed her with it fast enough! 1. Soak the chickpeas in the water with salt and the cinnamon stick for at least 4 hours. Overnight is perfect. Make sure that the chickpeas have expanded. 2. 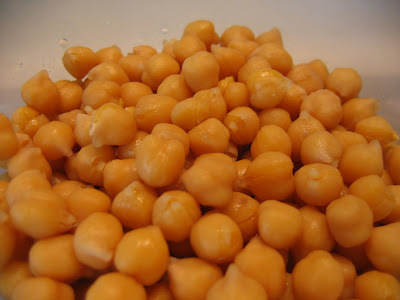 Put chickpeas with the soaked water (enough to cover the chickpeas) in a bowl and steam it in a steamer for 1 to 2 hours. 3. Strain the chickpeas and remove the cinnamon stick. Vóila! Chickpeas done. Enjoy the guilt-free snack! I've suggestions for soaking the nuts with tumeric instead of cinnamon. My granny used to do that, and tumeric gives the nuts a lovely yellow colour. However, tumeric stains, so if you're using it, soak the chickpeas in a metal container. My family loves chickpeas also because if you look at a chickpea, you can see it looks like a little chick-head.